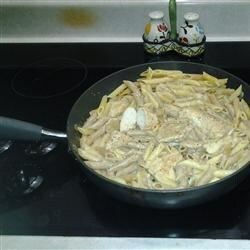 "A delicious spicy, but not too spicy, creamy chicken pasta! Easy to make! Serve with crescent rolls." Mix cider vinegar, 1/4 cup vegetable oil, seasoned salt, red pepper flakes, monosodium glutamate, black pepper, and salt in a resealable plastic bag. Place chicken pieces into marinade, seal bag, and marinate in refrigerator for 1 hour. Heat 2 tablespoons vegetable oil in a large skillet over medium heat. Remove chicken from marinade; discard used marinade. Cook chicken in hot oil until browned and no longer pink inside, about 10 minutes. Stir frequently. Transfer chicken to a bowl with a slotted spoon, leaving accumulated juices in skillet. Whisk whipping cream into pan juices and cook until cream has started to thicken, about 5 minutes. Stir chicken back into skillet and reduce heat to low. Simmer chicken in cream sauce until sauce is thick, 15 to 20 minutes. Bring a large pot of lightly salted water to a boil. Cook egg noodles in the boiling water, stirring occasionally until cooked through but firm to the bite, about 5 minutes. Drain. Gently stir cooked noodles into skillet with chicken and cream sauce. The orzo pasta in this chicken and sausage recipe is cooked risotto-style. great recipe! I only used 2 chicken breast.Next time I will add garlic & sun dried tomatoes.